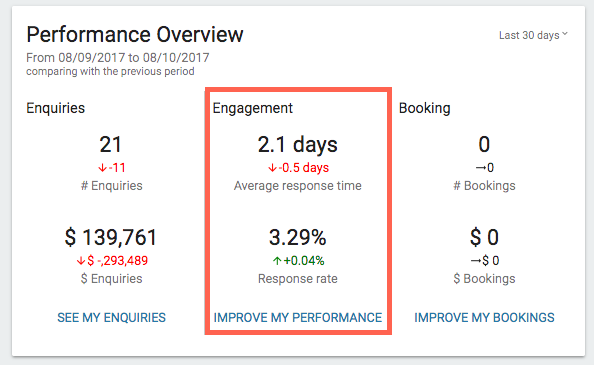 Improving your response rate and overall Venuemob engagement 'performance' will result in a higher ranking and more bookings. There are plenty of things that affect where your venue is ranked in Venuemob search results, and how visible it is to Venuemob customers. Aside from the completeness of your listing, we take into account how responsive a venue is to customers. That is, how promptly you respond to customers, and whether you respond to all enquiries. The thinking behind this: if we rank the venues with the best response rate higher, the customers that send them enquiries will enjoy a better experience – and thus will be more likely to book at those venues. Fact: Those who respond quickest are most successful. Venuemob customers send enquiries to about three or four venues per event they organise. Our statistics clearly show that venues who respond within four to eight hours are about four times more likely to book than event than those who wait 24 hours. And if a customer has received great responses from two of their four preferred venues before yours, they're likely not to respond to you at all. How quickly are you responding? Check out your engagement (your response time) in the Venuemob Manager home screen. If it's looking a little lacklustre, then it's time to pick up the pace. Free up your time – and make responding less of a chore – by using templates. We know that heaps of our venue partners use template responses as part of their day to day processes, so we've added a few to Venuemob Manager. Message templates use auto-fill fields like 'Enquiry date', 'Customer name' and 'Event type' to make sure even the most automatic response feels personalised. Once that first contact is made, the customer has been responded to and engaged with, and you're on your way to a booking (and being ranked higher). Feel free to use these ready-made tempaltes, or edit them to suit your venue's needs. Or, write your own unique templates. If you're working in a larger team, ensure each member is aware of template responses, so no one brings down the overall venue response rate. We know this is probably obvious, but it's worth repeating: having a chat to the customer on the phone about their needs is an amazing way of making a first impression that lasts. Although this occasionally isn't feasible for teams with heaps on their plates (which is why templates are so gosh darn useful! ), we highly recommend it. Just click 'Call' in your Venuemob enquiry to reveal the customer's number. What if some enquiries just aren't worth responding to? We know that can be the case sometimes. Each enquiry has a customer on the other end though, so they need a response. Everyone appreciates a good customer experience, and that's why we reward the venues that consistently provide this. If you're consistently receiving enquiries with budgets that are far too low, or completely unsuitable, we firstly recommend looking at the content on your listing. Does it accurately depict your venue? Does it give a potential customer enough certainty of information to make a qualified enquiry? Is your availability set? Have you added a price guide? Does your listing give an indicator of what event types are most suitable?